Watson Trading Company is a wholesale distributor that only sells to businesses. Friendly service and fast shipping. 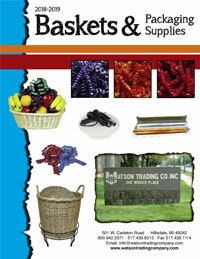 Check out our vast selection of baskets ready for immediate shipping. 1060101 12" Dia. x 5"
1040011 10" Dia. x 3"
1001250 10" Dia. x 3.5"
1001225 9" Dia. x 3"